This promises to be one of the most dramatic political party conference seasons for many years. These events have been hijacked and neutered by an army of spin doctors over the last 20 years and nowadays rarely manage to raise the political pulses. 2013 could be very different. It is quite likely that one of the three main party leaders will stagger out of their conference fatally wounded, destined to be dumped by their party before the next General Election in June 2015. For David Cameron, Nick Clegg and Ed Miliband the stakes are high as none has anything like the full confidence of their party, all have made serious mistakes in recent months and none of them has won over the wider public beyond Westminster. Miliband, of course, gets two throws of the dice as he will be speaking at the Trades Union Congress conference in Bournemouth this week as well as at the Labour conference along the south coast in Brighton a couple of weeks later. Ed was able to defeat his brother David in the leadership election because the trade union vote swung behind him. I don’t think there is much doubt that if that election was re-run today his brother would win as the trade unions feel deeply betrayed by Miliband Junior. So, his first task is to convince them that they didn’t make a mistake by putting him in charge. His troubles stretch well beyond the Labour movement, however, despite consistent leads for his party in the opinion polls. Miliband has not engaged the wider public and there is simply no enthusiasm around the country for a Miliband premiership. I think this is partly because he doesn’t always seem terribly engaged with the job of leading the Labour Party. It is almost as if he stood against his brother because he knew he could beat him, not because he had any real vision for the Labour Party or a strong anti-austerity narrative. The sense of dithering over the government’s attempt to bounce Parliament into backing an attack on Syria sums up his problems to me. His lack of engagement with the general public left him hesitant over what he should do when what was needed was a strong, principled argument against precipitative action. Instead he stumbled into taking up a position that broadly reflected the popular mood on Syria and seems unable to take much credit for it. For Nick Clegg, who takes to the stage at the Liberal Democrat conference in Glasgow next week, the problems are mounting fast, vividly underlined by the decision of one of his most popular MPs, Sarah Teather, to announce she will be standing down and firing a broadside at the Coalition’s record. His party membership is plunging and is widely thought be down to under 40,000 from its peak of over 100,000 in the Ashdown years. Since 2010 the Lib Dems have lost over one third of their members, throwing it into a financial crisis. This will be exacerbated if the reports of low delegate numbers and poor commercial support for its conference turn out to be correct. So far, very few senior Lib Dems have rocked the boat despite the massive decline in the party’s support. Perhaps they know this is their one opportunity to enjoy government office and so want to make the most of it, caring little about the prospect of many of them losing their seats in 2015. Perhaps it is the case that the party has lost its left wing (which seems to have been one of Clegg’s aims) and that those who are left really are very comfortable in coalition with the Tories. If either of these analyses is near the truth than we might be heading for a more permanent agreement between the Tories and the rump of the Lib Dems led by Clegg, rather as we had the National Liberal and Liberal Party split during the 1930s. It is getting increasingly difficult to see how the Lib Dems will be able to fight the next election as an independent party, especially if Clegg is at the helm. If he doesn’t manage to address this at his conference then he could find his leadership under increasing pressure. If he ducks this challenge and his leadership survives then that is probably an indication that many Lib Dems are now prepared to contemplate a longer term relationship with the Tories, possibly even starting with co-operation on fighting seats at the 2015 General Election. The final leg of the party conference season (apart from some of the minor parties) is the Conservative conference, which takes place in Manchester at the end of the month. Somehow, David Cameron has got to reassert his authority over his party, following the chaos of the Syria vote which reflected the growing disaffection with his leadership among his MPs. 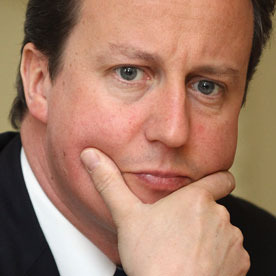 Cameron does have some decent cards to play, not least the first genuine signs of economic recovery. Also, on many domestic policy issues – gay marriage notwithstanding – he has taken a much more traditional Tory stance recently which should help him with the grassroots of his party, although whether such an approach has a strong appeal beyond that narrow base is open to doubt. I am not expecting any of the three leaders to go within weeks but I can see at least one coming out of the conference season just hanging on with the future of their leadership out of their hands. Several things might finish them off: a poor autumn in Parliament, events conspiring to expose their weaknesses, the ambition of colleagues overtaking their previous loyalty and, slightly further ahead, a poor set of results in the European elections. The Euros could throw domestic politics into turmoil, especially if UKIP and/or the Greens do particularly well. It will be panic button time by then if one of the parties wants to change leader as the General Election will be less than a year away. I can foresee a variety of scenarios that could see at least one of the leaders being axed but, at this stage but I can’t decide which way it will go and who is most vulnerable. I expect things to be quite abit clearer in a month’s time. 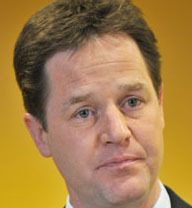 « Why is Clegg nailing his colours to Osborne’s economic mast?